When Gemma Hardy, a plain, shy orphan, loses her kind uncle to drowning, the roof caves in. Her aunt and cousins turn on her as though she were responsible, yet, as the astute young girl quickly notices, she’s the only one to mourn him. Humiliated daily, accused of sins she doesn’t commit, and punished when she pushes back, Gemma comes to believe that anything she loves will be squashed, and that no one will love or accept her. Offered the chance to go to Claypoole, a girls’ boarding school, Gemma seizes it with both hands. A sympathetic teacher tries to warn her that where she’s headed will feel more like an orphanage than a school, but she’s so desperate to escape–and to learn–that she ignores his advice. On arriving at Claypoole, she realizes that he was right: As a “working girl,” she’s more servant than student and the object of scorn and bullying, in which the faculty take the lead. No, this isn’t Dickensian London, though at least one adult to whom she manages to reveal her plight invokes the comparison. It’s 1950s Scotland, and the literary ancestor is Brontë, not Dickens. Livesey has set out to retell Jane Eyre, and what a captivating, satisfying job she does. I don’t remember the original that well, but Gemma meets her Rochester–a Mr. Sinclair, who owns a country house in the Orkneys–and their complicated relationship is fraught with untold secrets, none of which involves a madwoman or an attic. 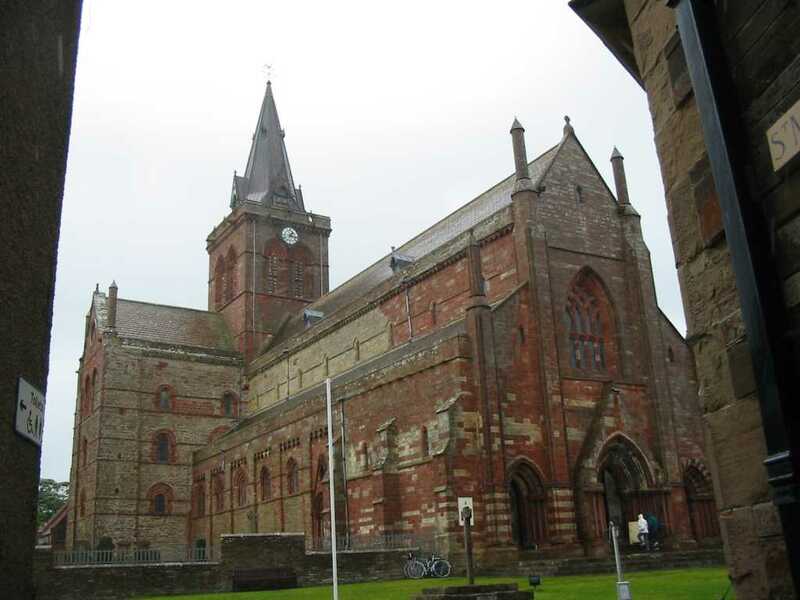 St. Magnus Cathedral, Kirkwall, Orkneys (Courtesy Wikimedia Commons; public domain in the US). I’d guess that Gemma has more poetry and resourcefulness in her than Jane, and maybe a stronger spirit of independence, though Gemma can more likely afford that, living a century later. Livesey paints the era lightly, in the background, yet it’s there, in the gradual, increasing breadth of opportunity for women not born to wealth or social position. We each begin as an island, but we soon build bridges. Even the most solitary person has, perhaps without knowing it, a causeway, a cable, a line of stepping-stones, connecting him or her to others, allowing for the possibility of communication and affection. Gemma spends the rest of the novel trying to realize these words and to understand what more her uncle might have said about them had he lived. Her journey takes her a long way, not in miles but in insight, and through many a heartache. Her hunger for connection, and her setbacks in finding it, lead her to think, “Not everyone who was fond of me died, but everyone came to harm.” However, she never, ever stops striving. The calamities come thick and fast, at times, but I never felt the narrative descended into melodrama, because–those of you who’ve read my reviews can guess what I’m about to say–Gemma has a highly developed inner life. Her dreams and desires feel real and earned, and Livesey has taken care to make even Gemma’s worst tormentors real people, invariably because they have their own torments and terrors. The brutes in Livesey’s world behave cruelly mostly because they feel precarious too. That they may also gain by it matters, of course, yet it’s secondary. Livesey grew up in Scotland, and she renders her native landscape, harsh as it sometimes appears, with such beauty that I feel a stirring to visit the Orkneys. She plays down the Gothic elements, a choice that suits me fine, though they’re there–voices in the wind, legends, a character or two with second sight. Toward the end, Gemma goes through a couple emotional transitions that passed by a bit quickly, maybe with more ease than I expected, and a final scene that comes about rather neatly. But this is a small criticism to make of a terrific novel.